We here at thirst. think you should learn all the time. It's a way of life and the best way to meet other fantabulous people making the world more nerdy. Sooo, to ensure you get your latest dose of nerdery, we are back August 21 with a few of our favorite things on stage and more than a few surprises. 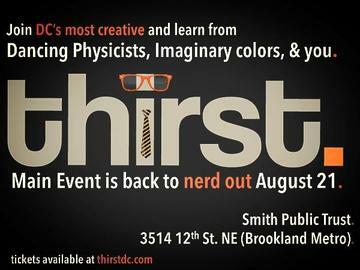 We're taking over the amazingly new and gorgeous Smith Public Trust at 7pm (doors @ 6:30pm) to give you the geeky goods. & as always, MOAR INFORMAL LEARNING!